If you took the newly purchased Recycled Cartridge out of its box, then neatly put it back in the box as you found it upon opening it. Find your receipt. If you can’t find it don’t worry it won’t matter. Go back to the store where you bought it (I went back to Office Depot). Go to the person in charge of ink and tell them you want to exchange your Recycled Cartridge for a Brand New Brand Name Cartridge because when you tried to use their Recycled Cartridge it stopped working after 1 print job and didn’t even complete the job. The person behind the counter will mutter behind their breath that you have to remember these are recycled blah blah blah – just ignore the guilt trip. 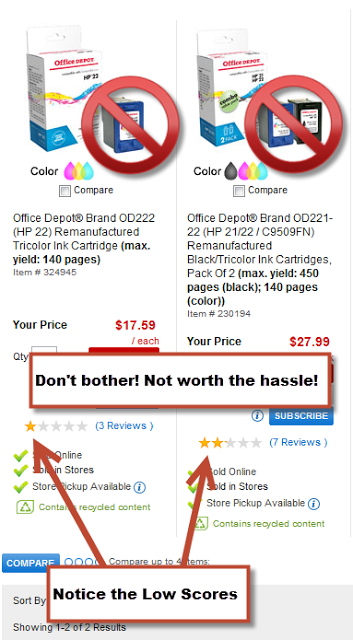 Pay the extra money you should have paid before for the name brand cartridges. Go back home and install the name brand cartridge that will not fail after the first print. Your Recycled Cartridge now works FLAWLESSLY. I made this mistake the other day again. I waited about 10 years to see if these recycled cartridges would get any better, but guess what? Even though the cartridge has ink in it and they don’t seem to leak like they used to, the contact pads on the cartridge are not replaced and are worn out to hell. I think that is the epitome of the problems with Recycled Cartridges. I wish I would have read that first before buying it and having to follow the steps I outlined above. But… What about the Environment? Okay, think about it this way. Which is worse? People going to the store to buy cartridges once or going to the store to buy cartridges twice because you have to return the crappy recycled cartridge? I wasted time and gas to go help a client with her printer because of this twice. I drove 12.4 miles twice because of this cartridge. That is a total of 24.8 miles to change a printer cartridge? Is that worth the emissions? So what I am saying ultimately is, until they fix these defects, don’t bother with these recycled cartridges, they are a waste. Lastly, I am sure there are some recycled cartridges that are better than others; for example I have used recycled toner cartridges and I have never had a problem. Oh I agree when getting them online do your research definitely. I went to a brick and mortar store and bought them hoping something would have changed by now. It was a spur of the moment thing because I needed them immediately. If I had the time to actually research before hand I would have and this post probably wouldn't have existed.